The quality of your life is not necessarily based on the quality of your circumstances; it’s based on your mental and emotional filters that determine your perception of the outside world. Your filters affect the way you see the world, and are determined over time by a variety of factors. We all have filters unique to our own lives, but we can consciously decide to reassess and change these filters over time. That is to say, you can’t control what happens to you in life, but you can control how you mentally and emotionally react to life events. Remember, your filters have been shaped by a number of factors – your culture, your socioeconomic status, your race, your religion, your values and your experiences all affect how you see the world. They influence the stories you tell yourself about who you are, what you’re capable of and what’s achievable or not. Think about the many stories you tell yourself, about yourself, on a daily basis. How many of them are beneficial to you? How many of these thoughts put you in a positive state of mind? How many of these stories reinforce negative, limiting beliefs about what you’re truly capable of? Is the way you’ve been viewing the world no longer serving you? The way you experience the world doesn’t have to stay the same – you can choose to change your filters at any time, you just need the tools to learn how to do so. 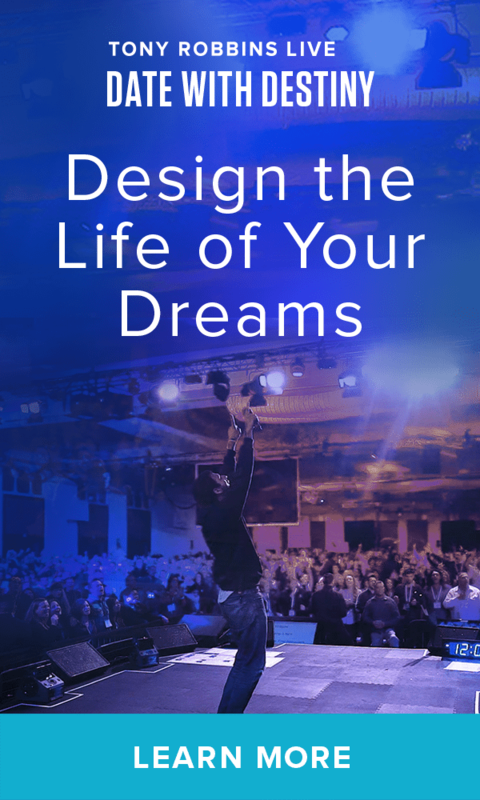 Millions of people have done this at Tony Robbins’ 6-day live event, Date With Destiny At Date With Destiny, you’ll learn exactly why you think, feel, behave, react and act the way that you do today. Then, you will learn how these current “filters” are, or are not, serving you and get the training you need to shift your mindset to once and for all eliminate negative thinking and design a life of true fulfillment. .
By rewiring the root of these filters, you can begin to change your habitual perception patterns. And one of the most effective ways of doing this is by asking yourself good life questions. Here is a sneak peek at 3 life questions you’ll discuss at Date With Destiny and how they can positively change your entire life experience. 1. What is something I can do for someone else today? The secret to living is giving. On any given day, are you thinking only about yourself, or are you considering what you can do for others? If you reframe your thoughts around the notion that you’re not just here to grow as an individual, that you want to actively be a part of and give back to the world around you, your life will feel more authentic and joyful almost instantly. 2. What beliefs do I hold and how do they serve me and those around me? All human beings are driven by the same six basic human needs. What differs among each of us, however, is how we value these needs and the beliefs we hold about the world around us. At Date With Destiny, you’ll learn what your primary values and beliefs are, and you’ll discover how they are serving or hurting you today. With this information, you can better understand the choices you make, as well as your emotional patterns. You have the power to shape your values and beliefs. Whether they empower you or hold you back, beliefs form the maps that guide you toward your goals and, ultimately, create the world you live in. Your breakthrough begins with a change in beliefs. With a belief structure that empowers you, you can virtually accomplish anything, bringing more joy and fulfillment to your life and to the lives of those around you. 3. What decisions can I make today to design a more positive and impactful life? Using the power of choice gives you the capacity to get past any excuse to change any and every part of your life in an instant. While you cannot control the events that occur around you, you can choose what to focus on; how to decide today to see your past problems as gifts. Your past doesn’t dictate your future – it’s the decisions you choose to make. Depending on what we choose, your decisions will empower, advance, frustrate or derail you. At Date With Destiny, you will learn that it is not your conditions but your decisions that control your life. Plus, get the tools to to shape and influence your choices moving forward. Once you’ve mastered your decisions, you begin to create the positive and impactful life you’ve envisioned. After attending Date With Destiny, you’ll discover that by routinely asking these questions, you will begin to frame the way you experience the day completely differently. Rather than viewing your mental and emotional state as the product of external forces, you will see how you can begin to shape the world around you simply by shifting your mindset. Rather than asking what you are getting from something or someone, you will start to ask yourself what value you can bring to the table. You will begin to approach different events and circumstances in a way that encourages problem-solving, contribution and growth. You will begin to see the gifts that you have to offer others and the positive impact you are able to make on the world around you. These questions to ask about life have the power to give you an entirely new perspective. You will begin to tell yourself new, empowering stories where the possibilities of what you can achieve are endless. If you want to raise the quality of your life, then start asking yourself quality questions – it starts with asking yourself these important questions every single day. Now the question is, are you ready for Date With Destiny?